The impetus for doing something beyond the basic dipole came with the promise of activating several of the Mt Buffalo summits in winter. I got thinking about an alternative antenna that could be erected in limited space, on the spot, with minimal spread, to avoid clambering over rocks and through bush to a point 12 to 15 meters distant. Up on Buffalo, there was reportedly not much option for wire antennas on The Hump (VK3/VE-019). And having been to The Horn (VK3/VE-014) last spring (before my SOTA activities had begun) I knew this was a summit with no room for anything other than what could be erected along the narrow fenced walkway. The squid pole, a 9 meter vertical support, seemed to be the obvious scaffold for a loaded vertical. Andrew VK1NAM came to the same conclusion for similar reasons. He whipped up a 5 meter long loaded vertical for 40 meters for his activation of Pigeon House Mountain VK2/SC-033 (Morton National Park). I drew some inspiration from his vertical experiment, and he listed step by step instructions that made the project look simple. His his blog page pointed me to Peter VK3YE’s Wadetenna, a 5 meter center loaded vertical for 40 meters that Peter carries on his back while operating standing on the beach and in the shallows. Then I discovered the excellent pages on loaded verticals of VK7JJ. I had no reason to make my vertical anything shorter than the full length of my 9 meter squid pole. Given that a quarter wavelength on 7100 kHz is just a smidgen over 10 meters, it seemed that not much loading would be necessary to make a 8 to 9 meter conductor look like a 10 meter one to radio frequencies. I elected to try the center loaded configuration with shortened radials. I will not reproduce step by step instructions with measurements, there is plenty of good information on the other pages. I’ll just describe what I did and how it worked. In a nutshell, I used 1mm multi-strand insulated wire from one of the two major hardware/household goods chains, a tapped loading coil wound on standard 45mm PVC pipe, set at the midpoint of a driven element of about 8 meters in length. I cut 4 shortened non-resonant radials of about 8 meters each. The vertical is coax-fed with no attempt to do impedance matching, just the center conductor straight to driven element and braid to radials. The loading coil. 16 turns on a 45mm PVC former, tapped at 7 and 11 turns with a shorting clip-lead at one end. It resonated with 11 turns in circuit. 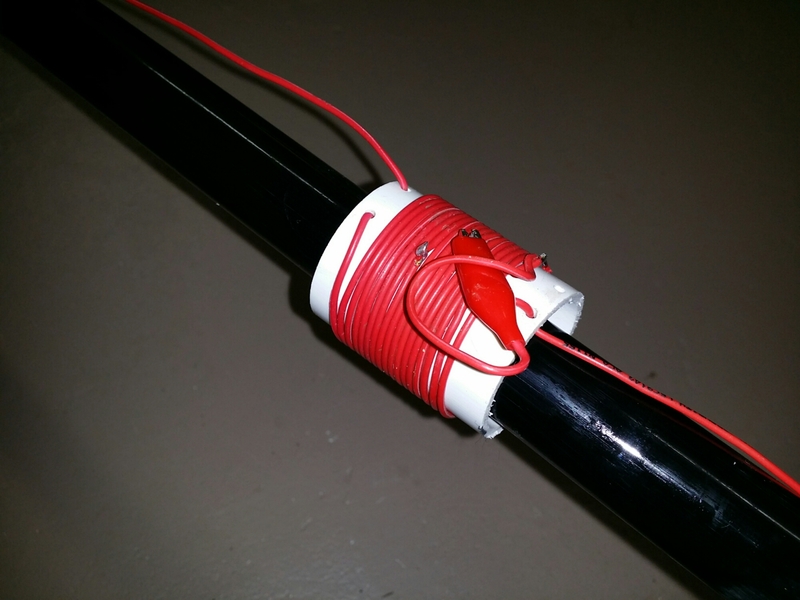 A cable-tie is used to secure the top section of wire to the tip of the squid pole. Note that the top half of my pole snapped off on Mt Beenak! Any non-conducting thing that won’t slip down the pole can be used. 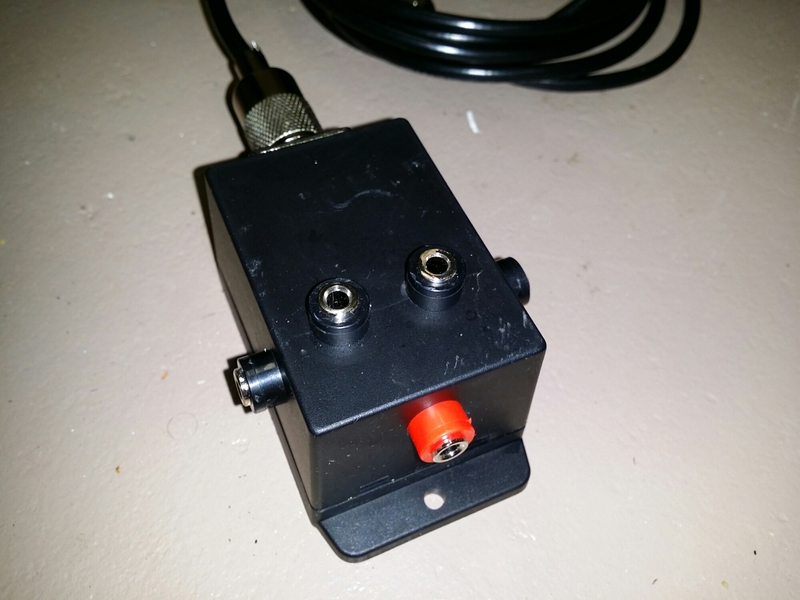 Termination box, built in a $5 plastic hobby box from Jaycar with a SO-239 socket and 5 banana sockets. Inside the wiring couldn’t be simpler. Tie the radial sockets to the braid and the center conductor to the driven element. 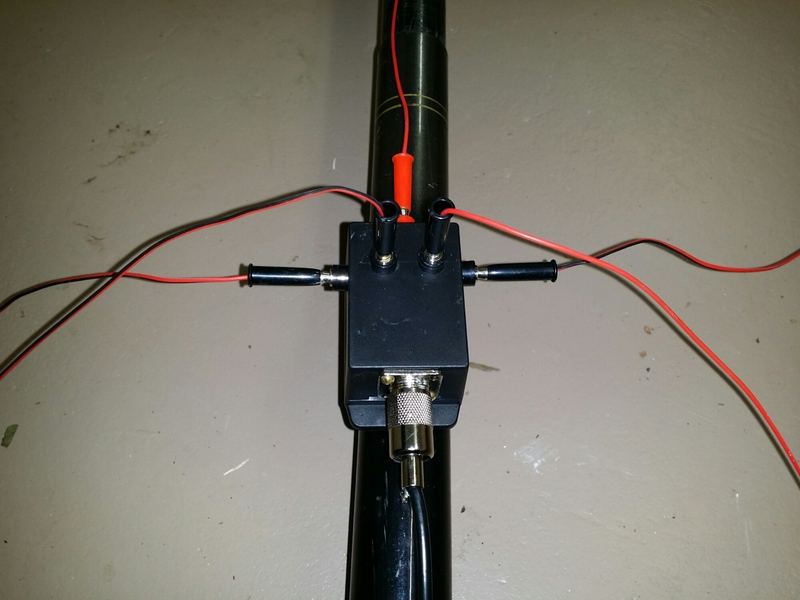 With driven element, radials and coax connected. None of the measurements are in any way precise. 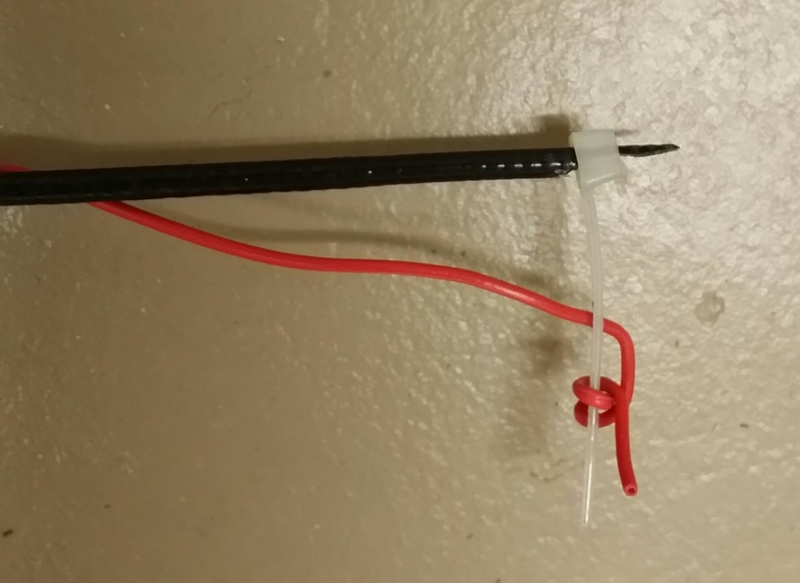 Making this antenna took me no more than an hour. It was a Sunday night after-dinner experiment. I had no expectations and I would not have been surprised if the thing behaved like a 9 meter high dummy load. I strapped the squid pole to a post in the backyard and erected the driven element, walking out the radials and casually dropping them on the ground. I left the entire loading coil in circuit. At the shack end I checked resonance on a Grid Dip Oscillator. Huge dip at 7.5MHz. Dropped the squid pole and shorted out the last 5 turns. Huge dip at 7.1MHz. That’s it! Not possessing an antenna analyser I manually plotted SWR across the 7MHz allocation. Consistent 1.2:1 across most of the band with a rise to 1.3:1 at the high end. I did nothing to deserve this unexpected joy! Sometimes, RF just works. The vertical has been used for three outings. There are pictures of it on summits in the blog entries for Mount Disappointment, The Hump and Gentle Annie. I have no measurement equipment so can only comment on the comparative signal reports on the vertical compared with the dipole. In general, I do just as well on the vertical as on the dipole. I notice no significant drop in antenna performance overall. 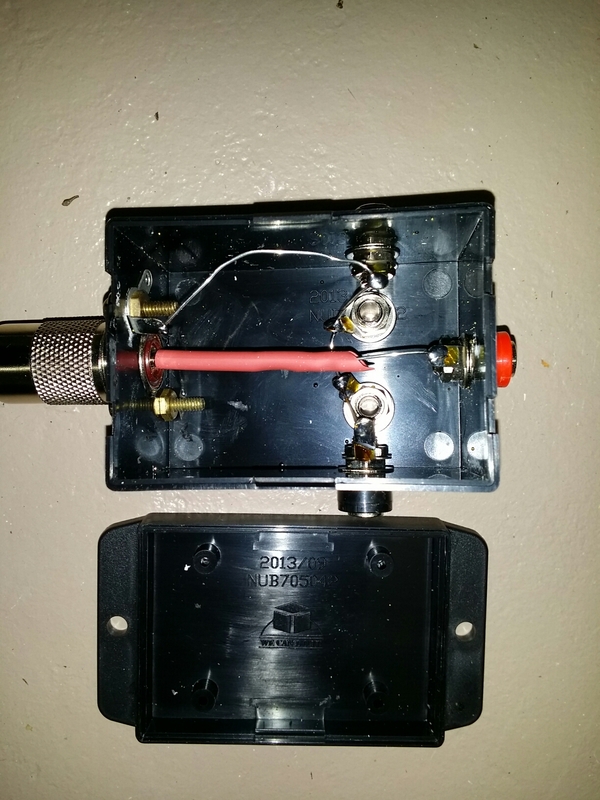 The noise level when the vertical connects to the receiver is slightly higher than that from the dipole. Interestingly, if I lay out and plug the radials in one by one, most of the received signal strength and band noise comes up with the first radial. Plugging in the second, third and fourth radials make proportionately less difference each time. On one rushed activation I left the forth radial off all-together. I guess this demonstrates the principle of a non-resonant counterpoise. During a typical afternoon activation, for VK3s the vertical is a few S-points down on the dipole, clearly not quite as consistent; but for interstate contacts it is one or 2 S-points better. That’s vertical polarisation for you. The center loaded vertical is lightweight, takes up less space, is quicker to erect and all round simpler than operating with a dipole. Making it was simple, quick, cheap, and fool-proof. As an antenna for SOTA activations it is effective. I know it may not be operating as efficiently as it could be but I am a confirmed maker and operator, not an optimiser, a talent I leave to those more patient and knowledgeable in the dark arts of RF than I.
I didn’t make it to The Hump the day on the Mt Buffalo plateau, I ran out of time, but even so the dirt road was closed so it would have taken a 3 or 4 km walk to get to the base of the track. I’ll try to get there in the spring. And when I do I’ll have the perfect antenna for it. good work with the vertical. In my teens I used a 16ft vertical on the garage roof, with a loading coil at about 5 ft. The coil was made of reasonably thick single strand wire. Using the garage roof as the ground system, this antenna gave me very good reports from JA, W and occasionally some EU stations on 40m CW with about 50 watts output from the 807s. It convinced me that for dx work, a vertical was superior to a low dipole. Since then I have found similar results but compared with a high dipole the difference isn’t so apparent. 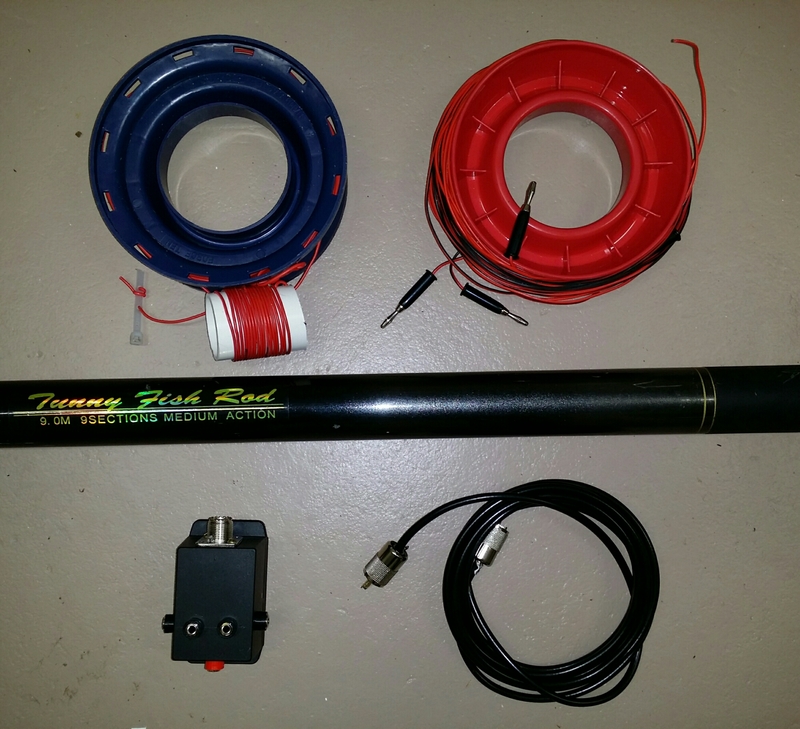 I think for SOTA in the next 4 years a decent 40m antenna for dx will be very handy so I am thinking of building a similar antenna. The modellers say that the main difference in performance between a vertical and a lowish horizontal antenna is the angle of radiation. Apparently all signals reflected by the ionosphere tend to be circularly polarised, whatever the transmitted signal was.